imagesJohn was raised on a dairy farm in Elizabethtown. After receiving degrees in English and Theology and finding verbal expression frustratingly limiting, he began to seek personal expression through sculpting. The response to his work was immediate and gratifying, and he spent the next decade sculpting and driving taxi in New York City, NY.In 1977 Hertzler returned to Lancaster County to work the family dairy farm and pretty much put sculpting on hold. 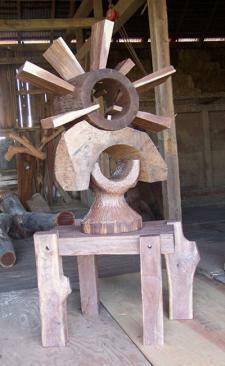 In 2000, he began to sculpt again in earnest above the heifer pen on the second floor of the bank barn. "It just feels good to be sculpting again," says John. Now semi-retired, he continues to "discover his voice," through his work in alabaster, marble and wood.John Hertzler is represented by the Lynden Gallery, Elizabethtown, Pennsylvania.